Cozy Chicks: BAD LUCK, GOOD LUCK, ARE YOU SUPERSTITIOUS? BAD LUCK, GOOD LUCK, ARE YOU SUPERSTITIOUS? Yesterday was Friday the 13th. (Yes, I know I'm a "day late and a dollar short," but this is such a fun blog topic, I just couldn't resist.) If you're reading this, I assume you survived Friday the 13th with no mishaps. So...no black cats crossed your path, you didn't open an umbrella in the house and you didn't walk under a ladder. How do you ward off bad luck? Garlic is supposed to protect you from evil spirits and vampires (although it may ward off your friends, too). Some people think throwing salt over your shoulder is protection against bad luck and they even claim you can "reverse" a pattern of bad luck by walking 7 times in a circle, clockwise. As a psychologist, I always find it interesting when my clients insist that their "fate is the stars" and I'm fascinated by their belief system. 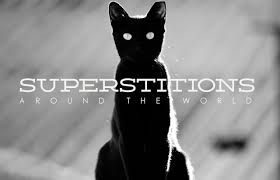 As a mystery writer, I know that statistically, writers, actors, musicians and entertainers are more prone to being superstitious than the rest of society. Why? Because so much of their career trajectory is out of their hands. Luck plays a large part in their success, so it's not surprising that they tend to be superstitious. And it's not just artistic types. Some celeb golfers insist on wearing a certain shirt for a big tournament and some Olympic gold medal athletes eat a "special" meal each night before the event. Many Broadway actors insist on a quiet time for meditation and getting centered before they go on stage and they are careful to repeat the same mantra each time. Superstitions can be harmless--unless we put too much stock in them. 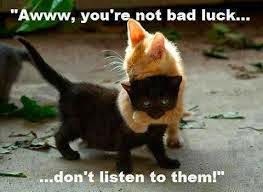 As a cat lover, I know that black cats are delightful creatures and are never responsible for bad luck! Do you have any special superstitions you'd like to share? I'd love to hear them! I do not have any superstitions that I believe brings bad luck. I am not sure how much of life is luck. There are those serendipitous times where we are in the right place at the right time. However, my Christian faith makes me believe many of those serendipitous times are God moments. I think there is probably a lot that says you make your own luck. If you never put yourself in the position you want to be in, it isn't going to magically appear. If I stick most of my tickets into a raffle that others are not paying much attention to, then there is a greater chance to win. I won two raffles in one night, one for a weeks stay at a lake house and one for an area rug. But I stuffed the "piggy"with tickets. If you only buy a couple of tickets, are your odds of winning are probably not good. One thing I always do is pick money up from the sidewalk or street. I hit it big one day when I stuck my hand in a freezing mud puddle and netted $50.00. I even went back into the store to ask if anyone reported missing money. Nope, I got to keep the fifty dollars. Was that luck or just a big surprize from years of picking up coins on the street. I think it was just the result of a habit, no luck involved. Someone may have told me it was my lucky day, but no one else stuck there had into a freezing puddle to pick up what looked to be a dollar bill. I have gone through some really rough patches in my life and I have had some great times. I don't think luck or bad luck played a role. It was just how the cookie crumbled. Hi Liz, I love your idea of "making your own luck." So true! Someone once asked Stephen King if it was better to be talented or to be lucky...he surprised everyone by saying, 'It's better to be lucky." Of course, he's both! Thanks so much for stopping by, and have a great week-end. I am not superstitious but I had an aunt who was. I was to have a C Section on a Friday 13th. She called me up and begged me to change the date. I didn't and he was a healthy 9 lbs, 5oz. I have always told him that every Friday 13 is his lucky day. I don't know if he believes me or not. I do believe in Luck. Wow--you definitely proved your aunt wrong!!! 9 lbs, 5 oz gives new meaning to the term, "bouncing baby boy!" Thanks so much for stopping by, Diane. I love little superstitions, Mary. I once won an award and I am convinced that it was because I was wearing my lucky bra. (I announced this to my friends in advance). A lucky bra?? LOVE it. Sounds like a great plot idea. Thanks for stopping by, MJ! As long as superstitions make people feel more secure and confident, I think they can be positive. However, superstitions that are taken too far can be harmful, and those I would worry about. I have a lot of quirks, but superstition isn't really one of them. I don't really believe that any one thing will bring good or bad fortune, but I do believe in luck, at least in a way. But most of my luck I attribute more to divine intervention (and, believe me, I often need an intervention!). There have been times when something bad "should" have happened to me, but didn't. I use those times as learning experiences - reminding myself to be more careful or aware. I feel the same way, Linda. Sometimes I've dodged a bullet and thought to myself, "What have I learned from this experience?" Usually it's to avoid a certain person or a set of circumstances. Thanks so much for stopping by! If I remember the books I read correctly (I read a lot of PNR and UF), wearing your clothes inside out, is to protect you from the Fae, so they can't glamour you. I think a horseshoe also helps against the Fae, as they can't handle iron. Of course finding those is very rare these days. And if you spill salt, then you have to throw it over your left shoulder to ward off bad luck. Spilling sugar means there will be visitors (not sure if they don't mean ants and bugs though). I am not superstitous, but sometimes lots of mishaps happen on a Friday the 13th. A day you should have stayed in bed. Some in my family were very superstitious and so I am not. My grandfather found his best job on Friday the 13th so he thought it was a good luck day and taught that to his children and grandchildren. My grandmother insisted that a man, not a woman, be the first to enter her home on New Year's Day. My aunt was into the use of salt protection and not walking under ladders. I have never figured out the why of any of it or how any of it was supposed to work. I believe that's why I don't pay attention to superstitions. I did have two tuxedo cats and a small all black cat - loved them all and they were great companions. Bad luck - never! I do believe in mystery and magic and awe and wonder, the unexplainable, the stuff of creativity, liveliness, delight. Thank you for today's smile, Mary. Having any cat, black or otherwise is lucky. I volunteer with per adoptions, and it is an unfortunate fact that black animals are harder to place. I have no idea why, but if you are looking to adopt a furry beast, don't overlook the black ones. Aurian, that's interesting, I hadn't heard that! Didn't know about the spilled sugar and visitors, either. I think I'll read up on this, thanks for stopping by! Robert, you are so right, it is sad that black dogs are the last to be adopted. I didn't know that about cats. I have an adorable little female tuxedo cat, Eliza, and had a wonderful male tuxedo cat named Siggy who passed away. I have a tribute to him on my website, thanks so much for stopping by.